Our factory in Tronica City, U.P. is a social symbol today for the villages around us as it is the only factory at this backward location in Greenland which provides employment opportunities. 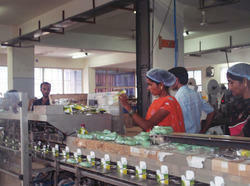 We make handmade soaps, ubtans and extract cold pressed oils which are labour intensive at this location. We have a special focus to empower women with employment, assistance with infrastructure to build schools to enhance education and to aid sourcing of clean drinking water. Our International State of Art machinery has the ability to increase capacity for meeting any growth opportunities. We develop the most inspired luxurious range for your custom amenities collection. Our bath and body products Formulations are of the highest possible standards. Consistency in quality is assured as for us "Satisfied customer will always come back" is the ambition. Regular audits in all areas of manufacturing makes us apart as proper QC is done.